File Name: Gregory B. Boyajian of Provo, Utah. Notes: Provo is in the north central part of the state, about 45 miles south of Salt Lake City. 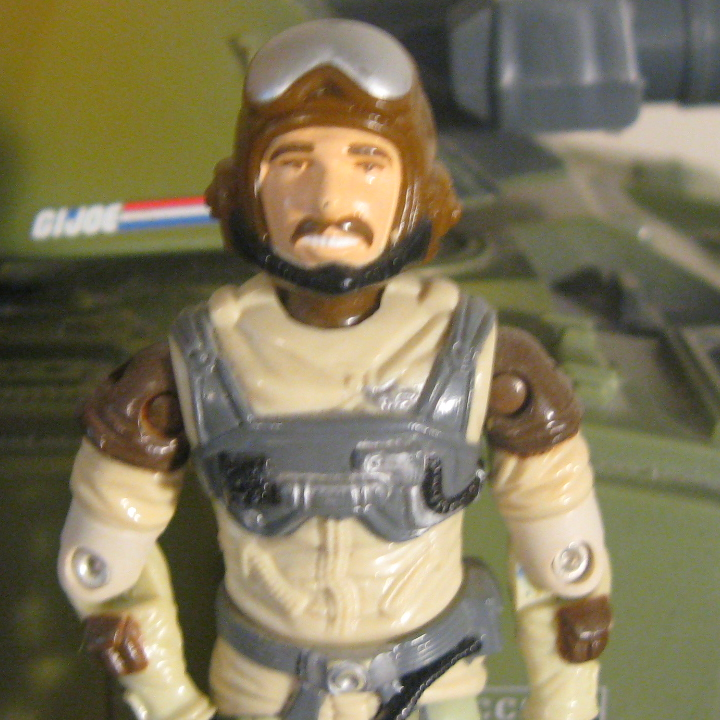 Sunbow's Slip-Stream wore his 1986 outfit, but the white portions of his uniform were light brown, and his hair was black. In Valor vs. Venom, Slip Stream spoke one line from inside the cockpit of a Thunderwing but was not quite visible through the canopy. Slip Stream was a video-game whiz and computer hacker until he discovered flying. He joined the Jr. Civil Air Patrol while a teenager and eventually got his Air Force commission through the R.O.T.C. He finished at the top of his class in flight school where his knowledge of computers and his lightning reflexes gave him a keen competitive edge. He speaks Armenian, Greek, and French, plays a mean game of table tennis, and is known in the "Pit" as an unrepentent [sic] joker and mimic. "An aircraft with computer assisted control surfaces can do things that are impossible for a conventional plane. (Flat turns without banking, flight axis shift, and horizontal rolls.) The controls are incredibly sensitive, the slightest tremor being translated into drastic movement. It takes a light touch to fly a ship like that and Slip Stream has the touch, the eye, the brain, and the guts to make that aircraft do exactly what he wants." Variations: The mouth shows individual teeth on some figures, simply white on others. Toy Notes: Item #6031. The prototype shown in the 1986 insert catalog has a white helmet. SLIP STREAM was a video-game whiz and computer hacker until he discovered flying. He joined the Jr. Civil Air Patrol while a teenager and eventually got his Air Force commission through the R.O.T.C. He finished at the top of his class in flight school where his knowledge of computers and his lightning reflexes gave him a keen competitive edge. It takes a light touch to fly a fighter jet that's tricked out with highly sensitive, computer-assisted control surfaces, but SLIP STREAM has the eyes, the brain, and the guts to make that aircraft do exactly what he wants. He speaks several languages fluently, plays a mean game of table tennis, and is known in the "Pit" as an repentant joker and mimic. "The controls are incredibly sensitive, so you have to have a steady hand to fly a jet. And it doesn't hurt if you have a streak of daredevil in you, too." Toy Notes: Boxed with the Toys 'R Us-exclusive recolor of the Conquest. Item #53262. The prototype shown on the box back is colored green instead of white and blue. Accessories: grey flight helmet with large black goggles and brown-grey air mask with long hose (new). SLIP STREAM was a video-game whiz and computer hacker until he discovered flying. He joined the cadet program of the Civil Air Patrol while a teenager and eventually got his Air Force commission through the R.O.T.C. He finished at the top of his class in flight school where his knowledge of computers and his lightning reflexes gave him a keen competetive edge. It takes a light touch to fly a fighter jet that's tricked out with highly sensitive, computer-assisted control surfaces, but SLIP STREAM has the eyes, the brain, and the guts to make that aircraft do exactly what he wants. He speaks several languages (Armenian, Greek, & French) fluently, plays a mean game of table tennis, and is known in the "Pit" as an unrepentant joker and mimic. "Aircraft controls are incredibly sensitive; the slightest tremor is translated into drastic movement. It takes a light touch to fly a ship like the THUNDERWING jet and make it do exactly what I want. And it doesn't hurt to have a streak of daredevil in you, too." Toy Notes: Item #53935. Copies exclusive to Toys 'R Us also included the figure Ace. LT. SLIP STREAM was a video-game whiz and computer hacker until he discovered flying. He joined the Jr. Civil Air Patrol while a teenager and eventually got his Air Force commission through the ROTC. He finished at the top of his class in flight school where his knowledge of computers and his lightning reflexes gave him a keen competetive edge. It takes a light touch to fly a fighter jet that's tricked out with highly sensitive, computer-assisted control surfaces, but LT. SLIP STREAM has the eyes, the brain, and the guts to make that aircraft do exactly what he wants. He speaks several languages fluently, plays a mean game of table tennis, and is known in the "Pit" as an unrepentant joker and mimic. "The controls are incredibly sensitive, so you have to have a steady hand to fly a fighter. And it doesn't hurt if have [sic] a streak of daredevil in you, too." Toy Notes: Boxed with a Target-exclusive update of the Conquest. Item #34115. Note that Lt. Slip Stream did not come with a personalized figure stand.